The 2018 edition of the European Theoretical Spectroscopy Facility (ETSF) Workshop on Electronic Excitations has been dedicated at fostering the cross-fertilization between different approaches to many-body phenomena, transcending the traditional barriers between disciplines. The workshop therefore brought together experts facing similar problems from different perspectives, for different applications, and often with a different language. Besides discussing application of many-body theories to excitations in condensed matter, i.e. 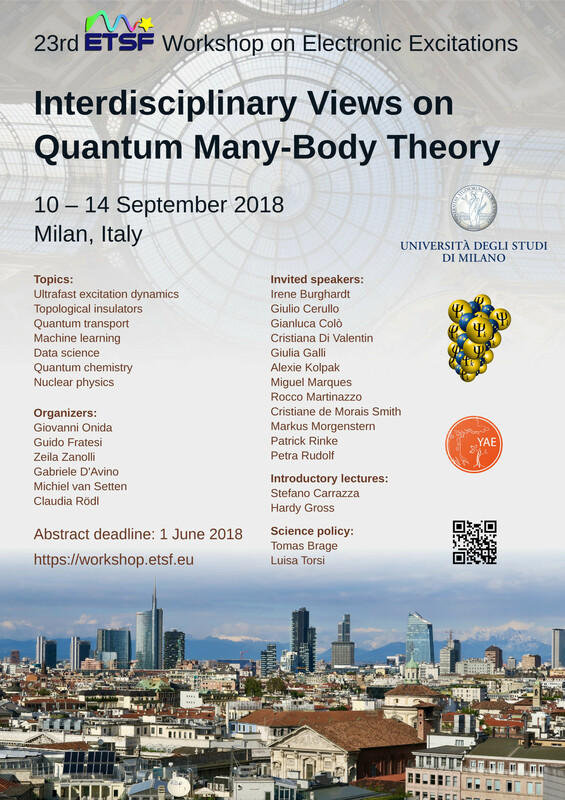 the traditional field of expertise of ETSF, topics covered by the workshop included nuclear physics, quantum chemistry, ultrafast excitation dynamics, quantum transport, topological insulators and novel algorithmic approaches to many-body problems inspired by machine learning and data science. The workshop program, detailed below, was enriched by two introductory lectures and a round table on Science policy. The scientific program included 15 invited communications (including 2 lectures and 2 introducing the round table), 27 contributed talks, and a poster session with more than 25 posters. The workshop has been attended by more than 80 participants. The workshop opening by Giovanni Onida introduced first the history of this workshop series starting from 1995. The topics changed across the years and have gathered the community in various EU countries to focus on specific methodological developments, different materials, spectroscopies, interaction with experimentalists, nanoscience, to mention a few. On this first day, two introductory lectures were scheduled. 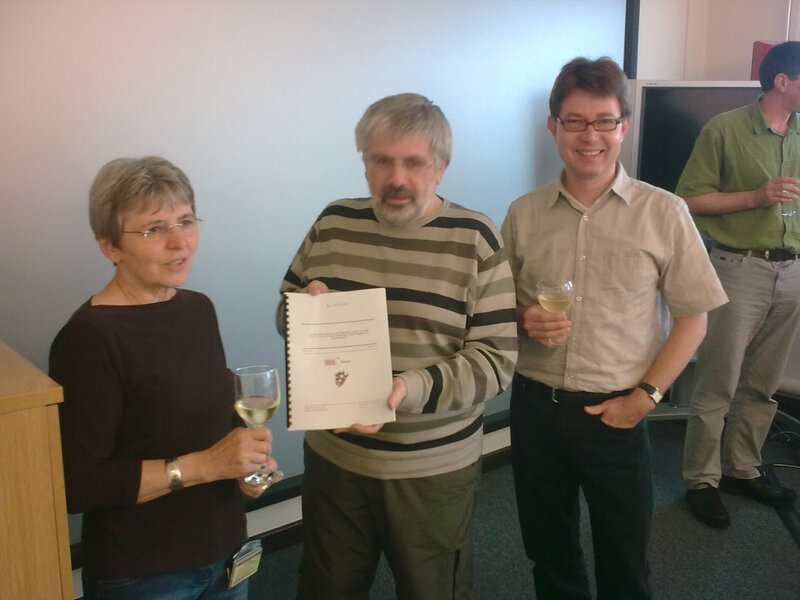 The first one was given by Hardy Gross: “Ab-initio prediction of quantum phases and their dynamics far from equilibrium”. The speaker faced the challenge to condense in a one-hour talk what is normally teached in two semesters, providing the participants an overview of the basic concepts of standard ground-state density functional theory as well as time-dependent DFT (TDDFT), and their relation to Green-function-functional theory. The use of these frameworks to describe quantum phases was then addressed, linking the basic theories to real-world examples. The second lecture, by Stefano Carrazza was instead about “Advanced machine learning approaches”. These methods, whose application rapidly increases in diverse fields of research, were presented starting from the basic concepts and linking to computer science and physics examples. The discussion then focused on a perspective view about implications, challenges, and directions for future developments. The workshop participants then moved to the Navigli area, a popular district in town, to gather for an informal welcome drink and dinner. The Tuesday morning session was dedicated to many-body perturbation theory (MBPT). The invited presentation of Patrick Rinke on the GW method opened the session. He summarized recent achievements of his group on benchmarking GW results, the GW method applied to core excitations and, in hybrid approaches in quantum chemistry ansatzes, to problems of strong correlation (dissociation limit of dimer molecules). He also pointed out future directions to use machine learning which are most promising for the prediction of spectroscopic properties of molecules. Subsequently, Christian Vorwerk exposed his results on core-level spectra with strong excitonic effects that have been obtained from the Bethe-Salpeter equation (BSE) of MBPT. The session continued with Brian Cunningham presenting his work on including excitonic effects into the dielectric screening within the quasiparticle self-consistent GW approach. Rex Godby, the last speaker of the morning session, exhibited GW calculations for numerically exactly solvable model systems and which allowed him to obtain conclusions for the non-locality of exchange-correlation kernels. The morning session ended with the ETSF general meeting. The first part of the afternoon focused on similarities and differences of the nuclear and the electronic many-body problem. In his invited talk, Gianluca Colò, a theoretical nuclear physicist, compared density-functional theory (DFT) in nuclear physics to DFT in solid-state physics / chemistry introducing the audience into the challenges that nuclear physicists face. Valerio Olevano then emphasized the importance to benchmark approximate many-body methods from condensed-matter and nuclear physics with known exactly solvable systems (e.g. the Hylleraas solution for the helium atom). The second part of the afternoon was dedicated to the coupling of excitations in many-body perturbation theory. First, Christoph Friedrich showed his work on electron-magnon scattering in ferromagnetic transition metals focusing on lifetime broadening and kinks that are visible in ARPES spectra. Then, Samuel Poncé outlined the impact of electron-phonon coupling on ab initio carrier mobilities in semiconductors calculated within the framework of the Boltzmann transport equation. The session was closed by Alberto Castro who present a survey of propagators for non-linear time-dependent equations which frequently occur in many-body approaches. The day ended with a two-hour poster session where more than 25 posters on a large variety of subjects were presented. Topics ranged from fundamentally new approaches to tackle the many-body problem over complex and exotic systems to applied studies that supplement experimental efforts. Wednesday morning was devoted mainly to Ultrafast Phenomena, a topic that is raising increasing interest among theoreticians and experimentalists alike as new methodologies allow treating with growing accuracy more realistic systems and complex phenomena. 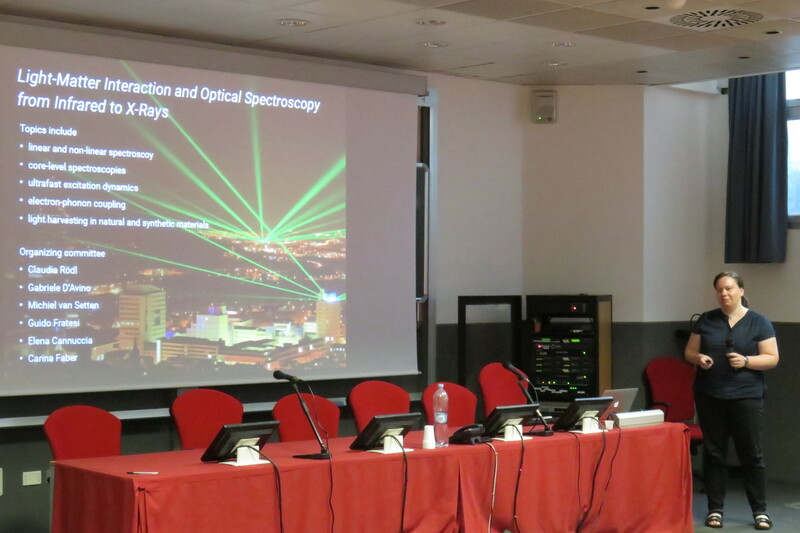 Giulio Cerullo introduced the topic from the experimental viewpoint with his invited talk “Ultrafast carrier and spin dynamics in two-dimensional semiconductors”. By presenting femtosecond transient absorption spectroscopy investigations of MoS2 monolayers, he identified the essential ingredients in the non-equilibrium optical properties of this material to be the renormalisation of both band gap and exciton binding energies caused by photo-excited charge carriers. Also, by time-resolved Faraday rotation and by helicity-resolved pump-probe spectroscopy, the valley relaxation dynamics and inter/intra-valley spin-flip processes were presented. On the theoretical viewpoint, the “Non-equilibrium real-time dynamics on TMDs: photoluminescence and Kerr signals” was the subject of Pedro Melo‘s talk. By a non-equilibrium Green’s function method, simplified by the generalised Kadanoff-Baym ansatz, he demonstrated how electron-phonon interactions can capture the short term behavior in monolayer MoSe2, and discussed the influence of temperature. Florian Eich‘s talk, “Time-dependent charge and energy transport in nanoscale devices”, presented non-equilibrium thermal Density-Functional Theory in the wide-band limit to investigate charge and energy currents through a nanojunction. The crossover from the ballistic to the viscous regime was noted as one of the key developments for the next future. Resuming after a short break, the participants could listen to Irene Burghardt invited presentation “Ultrafast Vibronic Dynamics of Functional Organic Polymer Materials: Coherence, Confinement, and Disorder”. Here the method of choice is the Multi-Configuration Time-Dependent Hartree (MCTDH) method and its variants, to assess exciton dissociation and migration. She presented a molecular level approach to organic photovoltaics, discussing exciton dynamics and the role of nano-morphology, focusing on the manifestations of electron-phonon coupling. Claudio Verdozzi‘s contribution, “KBE, GKBA, and Ehrenfest Dynamics”, started from advancements in non-equilibrium Green’s function formalism then moving to applications. Three cases were presented on the theoretical standpoint: charge separation in donor-C60 complexes, that is driven by electron correlations; correlation effects in friction; spin dynamics where skirmions could be moved by applying spin currents. The concluding morning contribution was delivered by Tuomas Rossi. In his “Real-time TDDFT modeling of localized surface plasmon formation and decay into hot carriers” he presented simulations of plasmon evolution in metal nanoparticles composed by hundreds of atoms. The session of Wednesday afternoon included talks on ultrafast phenomena and topological insulators. In her invited presentation “There is plenty of room at the bottom, but even more in a fractal” Cristiane de Morais Smith explored how electrons behave in fractal dimensions. Her group has shown theoretically and experimentally that quantum fractals can be made by patterning the surface states of Cu(111) with CO adatoms finding that the electronic wavefunction fractionalizes due to the geometric confinement in Sierpinski gaskets. Next, Matteo Cococcioni (First-principles modeling of mixed-valence compounds from extended Hubbard-corrected functionals) illustrated how extended Hubbard corrections to current functionals, including on-site (U) and inter-site (V) interactions, improve dramatically the description of the electronic, magnetic and structural properties, correctly describe localized states in the presence of significant inter-site hybridization, and capture excitations of charge-transfer character in transition-metal compounds. N. Tancogne-Dejean (Ultrafast modification of Hubbard U in a strongly correlated material: ab initio high-harmonic generation in NiO) demonstrated that the Hubbard U, the on-site Coulomb repulsion in strongly correlated materials, can be modified on femtosecond time scales by a strong nonresonant laser excitation in the prototypical charge transfer insulator NiO. Such a dynamically modulated U is crucial to describe the high-harmonic generation on NiO. The invited experimental tak by Markus Morgenstern (Giant tuning of graphene’s pseudospin polarization and valley splitting by a scanning tunneling microscope) focused on the exploitation of the van-der Waals force of an STM tip to locally lifts graphene from the substrate and inducing huge strain gradients. The latter produce a large pseudomagnetic field that induces spin polarization in the pseudospin sublattice. Further, his group as used an external magnetic field to tune the valley degree of freedom in graphene. 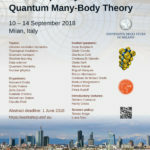 Following on topological insulating materials, Davide Grassano (Validity of Weyl fermion picture for transition metals monopnictides TaAs, TaP, NbAs, and NbP from ab initio studies) showed that a simple Weyl fermion picture is not enough to describe the real properties of transition metals monopnictides. 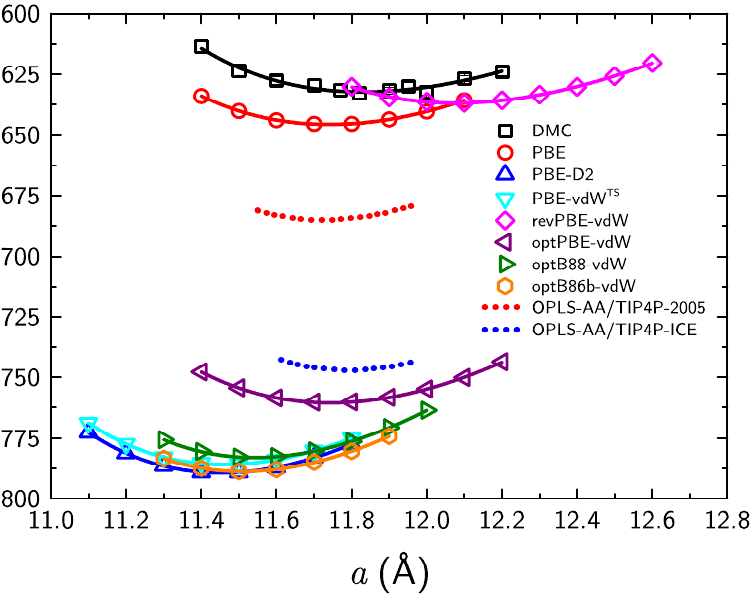 In particular, they found a deviation of the optical properties from the expected linear trend attributed to the tilt and anisotropy of the cones and to the presence of trivial points in the Brillouin Zone. The afternoon activities culminated in a session dedicated to science policy, namely on the lack of women in leading positions and the post-doc crisis. Quantitative data presented by Luisa Torsi (The role of women in science: still a long way to go) and a wise analysis by Tomas Brage (Why is physics still so gendered – and what can we do about it?) indicated that both issues can be related to the mith of meritocracy and to a “Herculean” culture. In the latter, competition is considered the main drive to success. In the following round table discussion, animated by Myrta Gruning and Patrick Rinke, we highlighted that science can only progress in a collaborative environment, which is further enriched by diversity (of experiences, of gender, of cultures…). We are reporting the outcomes of this discussion to the Young Academy of Europe (YAE) of which one of the organizers (Zeila Zanolli) is member and, via the YAE, we will deliver this message to the European Community science policy institutions. Thursday morning has been dedicated to the application of data science in materials science. The session was opened by the invited lecture by Miguel Marques, who illustrated the capabilities of deep neural networks in the discovery of novel stable materials and in the parametrization of classical force fields that are able to reproduce both the structure and the dynamical properties of target systems. The following interventions by Michiel van Setten, Pedro Borlido and Matthieu Verstraete brought the discussion to higher levels of complexity, discussing application of high throughput calculations and machine learning to (magnetic) alloys and two dimensional materials. The invited lecture of Giulia Galli discussed the importance of including temperature effects on electronic excitations by means of ab initio molecular dynamics, made possible by the recent algorithmic advancements in many-body perturbation theories developed in her group. The insurgence of superconductivity in layered materials pushed down to the atomic thickness limit was addressed in the talk by Petra Rudolf. Her angle-resolved photoemission experiments demonstrated the opening of a semiconductor gap in a six-monolayer thick MgB2 sample, with a determinant contribution from surface states that are qualitatively different from their bulk analogues. The talk has been particularly appreciated by the audience, also because of the frank discussion of the limits of DFT in reproducing experimental observations. Two dimensional (2D) materials have also been the topics of the following talks of the session. Zeila Zanolli, presented a DFT-based approach to interpret electron holography measurements outperforming standard techniques based on the independent-atom approximation. The anomalous optical properties of hexagonal boron nitride (h-BN) were discussed in the interventions by Claudio Attaccalite and Ludger Wirtz, who disclosed the role of electron-phonon interactions in activating dark transitions in indirect bandgap 2D materials. 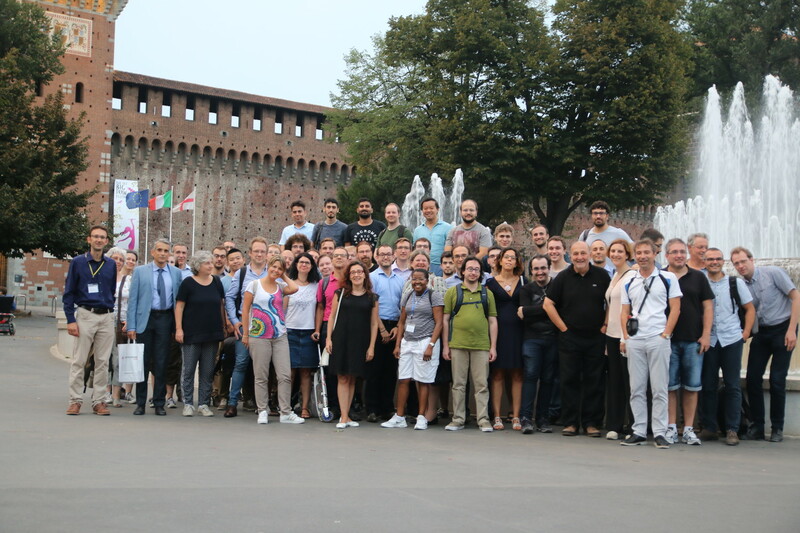 At the end of the scientific program, the workshop participants enjoyed a guided walking tour in the city center of Milan, followed by the social dinner, held in a restaurant close to the “Castello Sforzesco”. These social activities, attended by most of the participants, offered an informal setting for the pursuing of scientific discussions and were very much appreciated by the attendees. The session on quantum chemistry has been opened by the invited talk by Cristiana di Valentin, who illustrated her recent modelling work on responsive hybrid systems, such as oxide nanoparticle functionalized with organic molecules, for biomedimedical applications. Her talk pedagogically discussed the challenges of atomistic simulation of large systems (up to 4000 atoms) and their interaction with external stimuli such as light or a given chemical environment. Alberto Milani discussed the results of DFT investigations on the electronic, structural and vibrational properties of carbon atom wires, in particularly focusing on the metal-to-insulator transition induced by end groups. The talk by Anu Baby addressed metal-organic interfaces doped with potassium atoms. Her DFT calculations together with experimental spectroscopic and structural characterization yield a full atomistic understanding of dopants intercalation and the consequent charge rearrangements. The invited lecture by Rocco Martinazzo revived a long standing problem in chemistry, i.e. the fundamental differences between carbon and silicon. After a critical discussion of traditional textbook explanations, which were found unable to fully explain the complex phenomenology of the two elements, the author presented simple (Hubbard-like) models and ab initio calculations emphasizing the role of electronic repulsions on the tendency to form hybrid orbitals. The impact of electronic correlations on the higher chemical versatility of carbon, and on the structural organization in layered 2D materials have been discussed. The fundamental description of dynamic phenomena in quantum systems has been the subject of the two last talks. Nicole Helbig reported on her recent work on the non-adiabatic dynamics of a single electron source for which a exchange correlation functional nonlocal in time has been developed. The talk by Davide Sangalli focused on the role of electron-hole correlation on the exciton dynamics in condensed matter systems, presenting a novel non-equilibrium many-body perturbation theory approach to describe ab initio the coherent and non-coherent excitations in the low density regime. 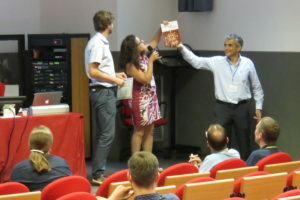 During the closing ceremony the prizes for best oral and poster contribution were awarded to Davide Soranzio (poster “Spectral dependence of the anisotropic effects of optical phonons on the optical properties of type-II Weyl semimetal WTe2”) and to Davide Sangalli (oral “An ab-initio approach to describe coherent and non-coherent exciton dynamics”). 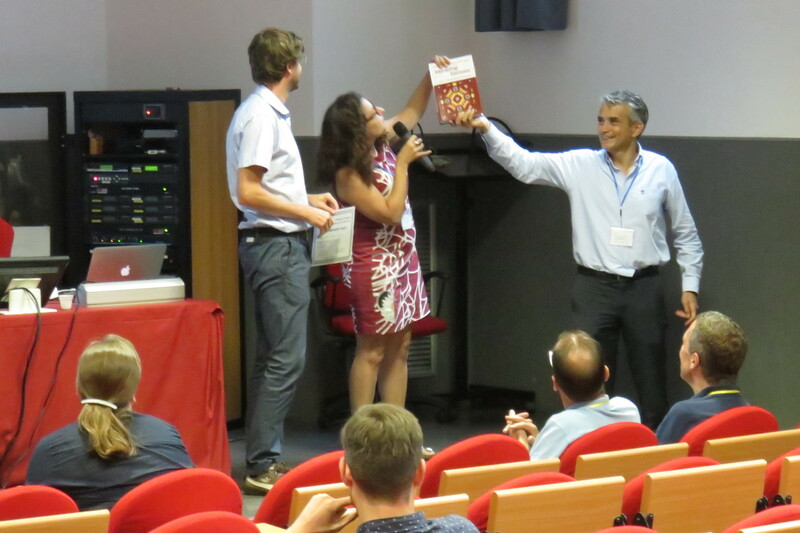 Davide Sangalli being awarded the “best oral” prize. 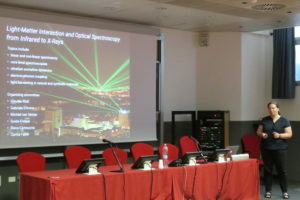 The closing remarks of the workshop were given by Rex Godby, who highlighted the advancements achieved in the many-body description of quantum phenomena in the last decades, through an historical overview of ETSF workshops. In emphasizing the need for a genuine cross fertilization between theoretical condensed matter physics and neighboring disciplines, his speech underlined the success of the 2018 edition, in terms of participation and scientific quality of contributions and discussions. See you in Jena in September 2019!